The Office of the Athletics Commissioner of Ontario has medically suspended 10 athletes who competed in Saturday’s “UFC 154: Jones vs. Belfort” event. 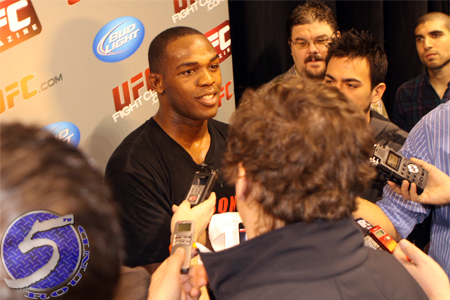 Light heavyweight king Jon Jones (Pictured), as well as five other fighters, were issued indefinite bans for various injuries sustained during their respective scraps. As expected, “Bones” must have his right arm cleared by a physician before he can return to action. Jones claimed he heard his elbow “pop” when Vitor Belfort slapped on a near fight-ending armbar in the opening round. Jones managed to escape and submit “The Phenom” with an Americana in the fourth frame. Roger Hollett, Charles Oliveira, Simeon Thoresen and Charlie Brenneman were also handed indefinite suspensions. Air Canada Centre in Toronto hosted this past weekend’s festivities.